We compared our work with several other research efforts. The comparison is not certainly exhaustive. 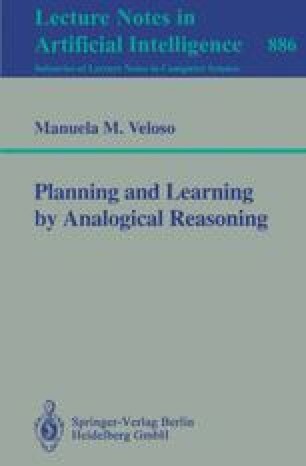 Instead it tries to focus on the more pertinent particular aspects of the analogical reasoning process. Our work overall develops a flexible integration of a complete derivational analogy reasoner, into a general purpose problem solving and learning architecture. The work opened new perspectives to the reconstruction approach, e.g., allowing automatic generation of annotations to the solution trace by building an introspection capability into the problem solver, and using learning abstraction techniques to create adequate memory indices. A final word of comparison between Prodigy/Analogy and other replaying systems in general: this work is unique in having automated the complete analogical cycle, namely the generation (annotation), storage, retrieval, and replay of episodic knowledge. It is also unique in its domain-independent approach and is demonstrated in particular in a case library of several orders of magnitude greater than most of the other CBR systems, in terms of the size of the case library and the granularity of the individual cases. Anapron is another example of an integrated rule-based and case-based system that was scaled up for the task of name pronunciation. Anapron uses a case library with 5000 cases, i.e., examples of pronunciation of names. These cases were provided externally, and each case illustrates at most the application of 8 operators. The more than 1000 planning problems solved by Prodigy/Analogy correspond to more than 8000 one-goal problems, the case library is built incremental and automatically, and cases grow up to sequences of more than 200 annotated decision steps.